Magdalena Carmen Frida Kahlo y Calderón de Rivera, better known as Frida Kahlo (July 6, 1907 to July 13, 1954), was a Mexican painter of the indigenous culture of her country in a style combining Realism, Symbolism and Surrealism. She was the wife of Mexican muralist and cubist painter Diego Rivera. Kahlo's life was a tragic one. Stricken with polio at the age of six and effectively crippled in a streetcar accident as a teenager, she defied the odds, not only by re-learning to walk twice in her life, but by going on to excel in her passion; painting. A child during the Mexican Revolution, Kahlo grew up in an era of social change. In the 1920s Frida espoused a Communist anti-capitalist philosophy. She befriended the famed Bolshevik revolutionary and Marxist theorist, Leon Trotsky, helping him gain political asylum in Mexico in 1937, who in August 1940, is assassinated. Possibly the most idolized woman artist of her time, she is a figure eliciting widely contrasting opinions. With 2007 being the centennial year of her birth, much attention has been re-directed toward documenting her life, and marketing her works. To some, she was a woman of legendary power who overcame incredible odds; an artist whose work inspires excitement and awe. To others, she was a public figure of highly questionable morals and politics who betrayed her gifts and celebrity. Kahlo was born Magdalena Carmen Frieda Kahlo y Calderón in her parents' house in Coyoacán, which at the time was a small town on the outskirts of Mexico City. Frida's father, of Hungarian Jewish descent, was born Wilhelm Kahlo in Baden-Baden, Germany, in 1872. At the age of 19 he moved to Mexico City and began a new life by changing his name to its Spanish equivalent - Guillermo. He never returned to Germany. In 1898 Guillermo married Matilde Calderon, a woman of Spanish and Native American descent. Four daughters were born of their marriage; Frida was the third. Kahlo's life was one of physical suffering marked by several tragic events. When she was seven years old, she was stricken with polio. As a consequence, one of her legs was smaller and thinner than the other. She overcame her disability with the support of her father's constant encouragement. Known for having a feisty and brash personality, these traits no doubt assisted her as well. Involved in a traffic accident between a streetcar and a bus when she was 18 years old, Kahlo's body was impaled on a metal rod. Her spine was broken in several places, and her pelvis, ribs and collarbone were also broken. Her right leg and foot were severely damaged; she again faced the challenge of re-learning to walk. Frida Kahlo grew up in a fertile valley in Mexico. Her home in Coyoacán, now a suburb of Mexico City, which was called "Casa Azul" (meaning blue house), was filled with flowers trees and cacti—nature brought indoors. Her childhood home was said to be a cheerful place, decorated in cobalt blue and bright yellows. She was born and spent her childhood in this home. She returned and lived there with her husband Diego Rivera, for the last 13 years of her life. Casa Azul is now known as the Frida Kahlo Museum. Rivera donated it to the Mexican people following his wife's death in 1954. It opened as a museum four years later, in 1958. It is impossible to study Frida Kahlo's artistry, marriage, morals and politics in separate veins. These aspects of her life were intricately intermingled, each affecting the other. Before this time, Kahlo had planned on a medical career, but gave it up for a full-time career in painting. Drawing on her personal experiences such as her troubled marriage, her painful miscarriages and her numerous operations, her works are often shocking in their stark portrayal of pain. Fifty-five of Kahlo's 143 paintings are self-portraits, often incorporating symbolic portrayal of her physical and psychological wounds. She was deeply influenced by indigenous Mexican culture, which surfaced in her paintings' bright colors, dramatic symbolism, and unapologetic rendering of often harsh and gory content. She exhibited several times with European surrealists, and her work was sometimes classified as such, but she did not agree with the description. "They thought I was a Surrealist, but I wasn't. I never painted dreams. I painted my own reality." she once said. Kahlo's preoccupation with female themes and the figurative candor with which she expressed them made her something of a feminist cult figure in the last decades of the twentieth century, though she was little known outside the world of art until the 1990s. 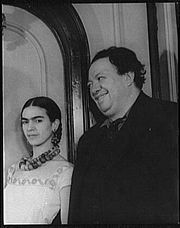 Frida married the famed artist Diego Rivera in August 1929 when she was 22 years old. Rivera, whose second marriage had just ended, was 42. Kahlo and Rivera had much in common; both were artists and both were avowed communist militants. When the couple returned to Mexico in 1935, Rivera embarked on an affair with Kahlo's younger sister Cristina, which marked a crucial turning point in their relationship. Kahlo was resigned to the understanding that Rivera had never been faithful to any woman, but the lines were crossed when her own sister became his brief partner. Another source of anguish in their marriage was their inability carry a pregnancy full term in order to have children, stemming from Kahlo's streetcar accident years earlier combined with years of use of opiates as painkillers. Without a child, Diego fulfilled all roles for Frida. She once referred to him as "my child, my lover, my universe." Frida Kahlo was described as a vibrant, extroverted character whose everyday speech was filled with profanities. She had been a tomboy in her youth and carried her fervor throughout her life. She was a heavy smoker who drank tequila in excess, was openly bisexual, sang off-color songs, and told equally ribald jokes to the guests of the wild parties that she hosted. The post-revolutionary movement, Mexicanidad, rejected Western European influences and what they termed the "easel art of the aristocracy.” Instead, all things considered "authentically Mexican,” such as peasant handicrafts and pre-Columbian art were favored. Rivera was a leading proponent of this movement when he met Kahlo, and she joined as well, adopting what became her famous look of traditional Mexican dress. She also rejected conventional standards of beauty for what was considered natural, her heavy brows and mustache. 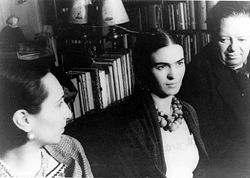 Kahlo and Rivera were both active in the Communist Party and Mexican politics. There involvement is now considered as somewhat quaint, but led them to embrace some shaky political positions. In 1936, Rivera, a dedicated Trotskyite, used his fame to petition the Mexican government to grant Trotsky and his wife asylum after they were forced out of Norway. The Trotskys lived with the Riveras, during which time Kahlo and Trotsky embarked on an affair. Trotsky was assassinated in Mexico (by a Stalinist agent), after which time Kahlo denounced him. Not only did there seem to be personal bitterness; Kahlo had become a devout Stalinist. Even after it had become common knowledge that Stalin was responsible for the deaths of millions of people, she continued to worship him. One of her last paintings was titled "Stalin and I," and her diary was full of such scribblings as "Viva Stalin!" and the expressions of her desire to meet him. Frida Kahlo leaves behind a mixed legacy: she is both greatly admired and starkly criticized. Her ascent to greatness in 1983 stemmed not from her works of art, but from the publishing of her biography written by Hayden Herrera. Frida had left diaries that are the source of much information about her life. Her fans seem drawn to the story of her physical suffering, marital heartbreak and glamorous friends and lovers. Her artwork itself, almost an afterthought, simply told the story. "Diego and Frida ought not to be subjects of beatification but objects of study—and of repentance … the weaknesses, taints, and defects that show up in the works of Diego and Frida are moral in origin. The two of them betrayed their great gifts, and this can be seen in their painting. An artist may commit political errors and even common crimes, but the truly great artists—Villon or Pound, Caravaggio or Goya—pay for their mistakes and thereby redeem their art and their honor." . ↑ Artmaker: Questions about: Frida Kahlo . Hispanic Research Center, Arizona State University.Retrieved June 1, 2008. ↑ .PBS.org. Retrieved June 1, 2008. ↑ . Retrieved June 1, 2008. ↑ .Retrieved June 1, 2008. ↑ The Frida Kahlo Museum (CASA AZUL) . Bilingual English and Spanish Retrieved June 1, 2008. ↑ ARTIST HERO: FRIDA KAHLO by Jennifer Beck.Retrieved June 1, 2008. ↑ "The Life and Times of Frida Kahlo" Film promotion..PBS.org. Retrieved June 1, 2008. ↑ "The Trouble With Frida Kahlo Uncomfortable truths about this season's hottest female artist." By Stephanie Mencimer, June 2002, . Washington Monthly Retrieved June 1, 2008. ↑ Artchive. Retrieved June 1, 2008. ↑ . Hispanic Research Center, Arizona State Univ.. Retrieved June 1, 2008. ↑ Artchive .Retrieved June 1, 2008. ↑ "The Live and Times of Frida Kahlo" .PBS.org.Retrieved June 1, 2008. ↑ "The Trouble With Frida Kahlo Uncomfortable truths about this season's hottest female artist." By Stephanie Mencimer, June 2002, .Washington Monthly. Retrieved June 1, 2008. ↑ My Hero. .Retrieved June 1, 2008. ↑ Artchive. .Retrieved June 1, 2008. ↑ Mencimer, .Washington Monthly. Retrieved June 1, 2008. Alcantara, I., & Egnolff, S. Frida Kahlo and Diego Rivera. London: Prestel. 2001. Herrera, Hayden. 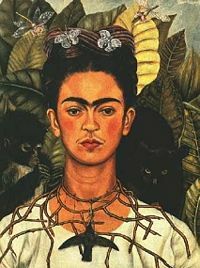 Frida Kahlo: The Paintings. New York: HarperCollins, 1993. This page was last modified on 12 May 2017, at 22:04.